No stacks of armies, no hexes, no overly-lengthy rules to learn - Hitler�s Reich takes five minutes to set up and two hours (or less!) to play. Players fight over Europe, across North Africa, the Atlantic and Mediterranean, and into Russia using a simple dice-enhanced conflict card comparison combat mechanism. Or, as one BGG poster better put it, "a simultaneous revelation of cards similar to Twilight Struggle�s Headline Phase, but with a choice of what Conflict Card to play" - all with dice added in. High-quality wooden pieces mark their progress, which is aided economically, politically and on the battlefield through the competition for and play of Event Cards drawn from three unique decks: one for the Axis, one for the Allies, and one from which either side can attempt to draw. 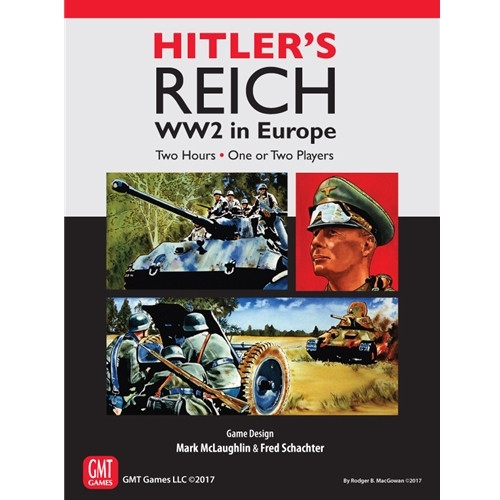 Hitler�s Reich is the first of the Card Conquest System game series in which players recreate epic military contests of history in short, comparatively simple and easy to learn, but hard to master games. Designed to be set up in minutes and played to conclusion in one sitting, these are not simulations but games, albeit ones packed with enough historical flavor, excitement, and decision making to give you the feeling of being there at the highest levels of command. In Hitler�s Reich, one side is the Axis of Nazi Germany, Fascist Italy, and their East European minions. The other is the Allies of the United States, Great Britain and the Commonwealth, along with the Soviet Union. It is April of 1941 and Hitler, already master of Europe and much of the Mediterranean, is poised to launch his great march East � Operation Barbarossa: the invasion of Soviet Russia. Unfortunately for his ambitions, his Italian partner is in trouble, so he is faced with pressure to divert forces to drive into the Balkans and commit more resources to the Western Desert. For that matter, why invade Russia? Perhaps the defeat of Britain via a naval/U-Boat campaign including the conquest of North Africa and The Middle East, leading to an invasion of Great Britain itself is a better course to victory? These are the kind of strategic choices the Axis faces. As the Allied high command, will you succeed in throwing back this onslaught and eventually liberate Europe via a Soviet counter-offensive and Operation Overlord�s amphibious invasion of France? Or as the Axis leadership, will you triumph over all and create the thousand-year empire that would have been Hitler�s Reich. Note: Although Hitler�s Reich is designed for two players, a three- and four-player variant is included for multi-player and team play as well as an intriguing solitaire game. 2 player Aid Sheets/Cards (back printed) ?